This page is dedicated to all of our fans. If you have a recipe you’d like to share, please email it to: info@onceagainnutbutter.com Click here to find more recipes. Who doesn’t love granola? It’s crunchy, rich and good for you – so much better to take as a hiking snack than a candy bar, or to serve at breakfast instead of puffed rice! But it’s expensive to buy, and too fussy to make, and unless you buy it from a specialty shop or farmers market, there might be some preservatives and fake flavorings in there that you really don’t want. That is, unless you make your own granola using Once Again products and my super secret stove-top recipe! Seriously, this granola is so quick and easy to make, anyone can do it in a spare half hour. However, I must warn you, it is so good you may end up eating it before tomorrow’s breakfast. Enjoy! Preheat oven to 325 degrees. Line rimmed baking sheet with parchment paper and set aside. In 2 qt. pot, heat oil over medium heat and pour in oats. Toast oats, stirring frequently, for 8-10 minutes until lightly browned. Lower heat and dump oats onto sheet pan. Add the remaining ingredients to the pot and cook over low heat until butter is melted and other ingredients are incorporated. Remove pot from heat and pour in peanuts and oats, stir well to coat. Dump granola onto baking sheet and spread in an even layer. Cook for 10 minutes, no need to stir. Remove from oven and allow to cool. Store in an airtight container. * This recipe can be made vegan by using coconut oil and agave in place of the butter and honey. Experiment and add different OA nut butters, other nuts and seeds, or spices. Shelley Viggiano is the mother of two girls, an ultra distance athlete, foodie and super fan of Once Again products. She lives with her family in Western New York. It’s recipe time! With jars of goodness like Dawes Hill Honey, Tahini, Cashew Butter, and Almond Butter waiting in the wings – I’ll be sharing my favorite recipes using Once Again products with you each month. Sometimes it’ll be a healthy snack or main course, other times maybe a tasty breakfast smoothie, and if your lucky – I’ll make you a few dessert treats too! This time we’ll be tackling “cheesy” vegan kale chips. A recipe that is healthy and incredibly rich and tasty! If you haven’t tried Kale chips yet…where have you been?! Sure you can buy them in a bag all ready to eat, but if you make your own you can customize the flavor, and boost the nutrition, and it’s not hard – I promise! Kale is a superfood – loaded with antioxidants, flavanoids, and omega 3 fatty acids. 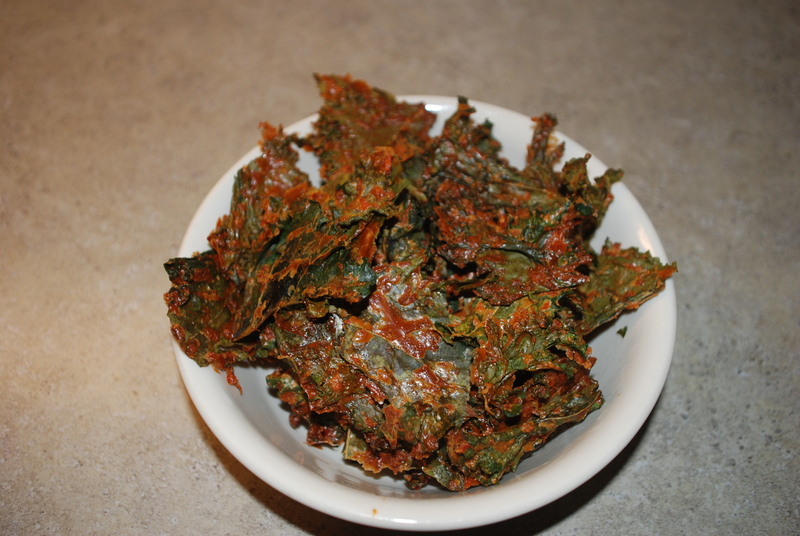 One cup of cooked kale gives you over 1000% or your recommended daily allowance of vitamin K, and 90% of your daily dose of Vitamin C. Because of how nicely kale dries out, and crisps up in a low oven or food dehydrator, they make a perfect healthy snack food – way better than a bag of potato chips. Though these chips are “cheesy” they are 100% vegan, and the cheesy flavor comes from nutritional yeast – a complete source of protein and B-complex vitamins. The flavor is given more body with Once Again Organic Cashew Butter, adding another hit of protein and healthy fat. The end product tastes like a cheesy and earthy hummus dried to shatteringly crisp chips. So delicious, and a perfect recipe to make for an appetizers party. Have I enticed you enough? Great – here is the recipe! In a food processor or powerful blender process all ingredients besides the kale until smooth. It will take a while to break up that bell pepper, so settle in. The consistency should be like thick pea soup, you may need more – so add water a TBSP at a time to make it smooth. Pour the mixture over the ripped up kale pieces and toss with your hands to coat all sides well. Place the kale in a single layer on 2 parchment lined baking sheets. (If you have a food dehydrator, and can wait all day – dehydrate the chips for 7-8 hrs at 120 degrees). Bake chips for 90 minutes or until really crisp and crackly. If you have some chips that are still a little “chewy” remove the finished chips and put the rest back in the oven. I’m so glad you are enjoying them! That is great news! The Kale Chips sound interesting. Never thought of adding nut butter to them. Bet they’re yummy. These are some recipes I am going to have to try! Love your almond butter in smoothies! Those Cheesy Vegan Kale Chips look to die for! I would definitely love to try the Vegan Kale Chips! They look so good! Thank you for sharing this Peanut Butter Stove-top Granola. It is out of this world delish! “Cheesy” Vegan Kale Chips is the max! Thank you!